O Romeo, Romeo, wherefore art thou Romeo? Romeo Crennel is here, in Kansas City, as the Chiefs new head coach. Crennel is the 12th head coach in Chiefs history, a franchise that has failed to establish a long-tenured head coach since the 1990’s when Marty Schottenheimer coached Kansas City for just over a decade. Crennel has been around the game of football for nearly 45 years. He started his coaching career in the college ranks with Western Kentucky University as the defensive line coach in 1970. After 4 years with the Hilltoppers, Crennel became a defensive assistant at Texas Tech University. Following his tenure at Texas Tech, Crennel moved on to Georgia Tech, where he was the defensive line coach for the Yellow Jackets in 1980. Crennel finally got his shot in the NFL as a special teams assistant the following season for the New York Giants. After two season with New York, Crennel became head special teams coach for the Giants for seven seasons (1983-1989), where he was reunited with his former mentor, Bill Parcells, who helped guide Crennel at Texas Tech in the mid 1970’s. Crennel was instrumental in building the “big blue machine” of the 1980’s in New York. Under the direction of Parcells, the Giants won 2 Super Bowl Championships (1986, 1990) with Crennel on the staff as defensive line coach and assistant head coach. When Parcells stepped down as Giants head coach following Super Bowl XXV, Crennel stayed with the team under the two year tenure of Ray Handley. Crennel then left New York and worked as the defensive line coach for the New England Patriots for four seasons (1993-1996) and for the New York Jets for three seasons (1997-1999) during the time that Parcells was the head coach for each franchise. Romeo finally got his shot as a defensive coordinator in 2000 when he filled the role for long time friend Bill Belichick for the Cleveland Browns. When Belichick was hired as New England’s head coach just one year later, Belichick took Crennel with him and appointed to the same position, defensive coordinator. Crennel was apart of possibly the greatest NFL dynasty of the modern era in New England as the Patriots defensive coordinator for the Super Bowl championship seasons of 2001, 2003, and 2004. Crennel was named NFL defensive assistant of the year all 3 years.Following the 2004 season, Crennel was interviewed by the Cleveland Browns, San Francisco 49ers, Miami Dolphins, and St. Louis Rams as a potential candidate for a head coaching job. Crennel decided to return to Cleveland to be the head coach of the Cleveland Browns where he was hired on March 4th, 2005. Crennel went 6-10 and 4-12 in his first two seasons with the Browns, finishing last or tied for last in the AFC North and missing the playoffs each year. The Browns finished the 2007 season with a 10-6 record, just falling short of making the playoffs. Crennel’s success in the 2007 season earned him a two-year contract extension in January 2008. On December 29th, 2008, following a disappointing 4-12 season and another last place finish by the Browns, Crennel was fired. Romeo led the Browns to a disappointing 24-40 record in his 4 seasons with Cleveland. The Browns finished last in the AFC North 3 of his 4 seasons as head coach, and they failed to reach the postseason. Crennel did not coach anywhere in 2009, but was hired in prior to the 2010 season by the Chiefs. He was the defensive coordinator for Kansas City in 2010, where the Chiefs won their first AFC West Division title since 2003. Following Todd Haley’s termination as the team’s head coach in 2011, Crennel was named the team’s interim head coach for the remaining 3 games of the season. Crennel lead the Chiefs to a 2-1 record over the final 3 games, highlighted by a 19-14 win over the then undefeated Green Bay Packers at Arrowhead Stadium. Crennel has served as coordinators under all-time greats like Bill Parcells and Bill Belichick and has won 5 Super Bowl titles under the formentioned coaches, but failed in his only stint as a head coach in Cleveland. Under Crennel, the Chiefs defense certainly has improved over the last couple of seasons. But how will Crennel handle the roll of being head coach? Only time will tell, but I think it is safe to say that without Parcells and Belichick, Romeo would not be in the position he is in today. But after all, Belicheck failed in Cleveland as a head coach, too, and he is by far the most accomplished NFL head coach in the last 25 years. Hopefully similar things will happen for Romeo and the Kansas City Chiefs. This entry was posted in Football, Home, Midwest, Uncategorized and tagged Chiefs, Romeo Crennel. 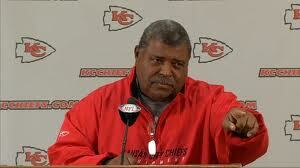 I was glad that the Chiefs named Crennel their coach. I thought the Browns were very shortsighted in letting him go after 4 seasons. And after Todd Haley, they could have done a lot worse. I wish the Chiefs and Crennel well – and I hope they give him more time than the Browns did to see what can happen. I agree completely, Romeo was a good hire now the Chiefs need to worry about signing Brandon Carr. Also, they need to clean up all this bugging the phones junk that is being thrown around throughout the media. The Chief’s have a bright future with Crennel. The defense looks promising and as we all have seen, THAT’S what wins especially in the post season. Just look at S.F., Giants, Ravens, etc..
Good luck to Romeo and to you guys! I hope the Chiefs keep this guy around. He’s a Great Defensive mind.